A member of the rose family, Spirea (Spirea spp.) is a delightful shrub with a multitude of small white, pink or red flowers that bloom in spring into midsummer, depending on location and variety. Native to a wide number of climate zones such as Japan and North America, this easy-to-grow plant is prized for its low maintenance and beauty. Attaining a height of 6 feet or more, Spireas have graceful arching branches with drooping, fragrant flowers. Spirea prefers sun or light shade, but it blooms more profusely in full sun. They are known to thrive as far north as Maine and can endure cold winters if protected from the elements. Ordinary garden soil suits Spirea just fine no need to amend your soil with added ingredients unless it's heavy clay. If you have clay soil, just mix in a bit of peat moss or leaf mulch. Spireas are effective in mass plantings, along garden walls and fences, or as informal hedges. The flowering branches make excellent cut flowers and bouquets: just snip the stems when they first start flowering, dunk them in warm water and then slit the cut ends (which will encourage them to take up water). The genus Spirea includes nearly 100 species of flowering shrubs. 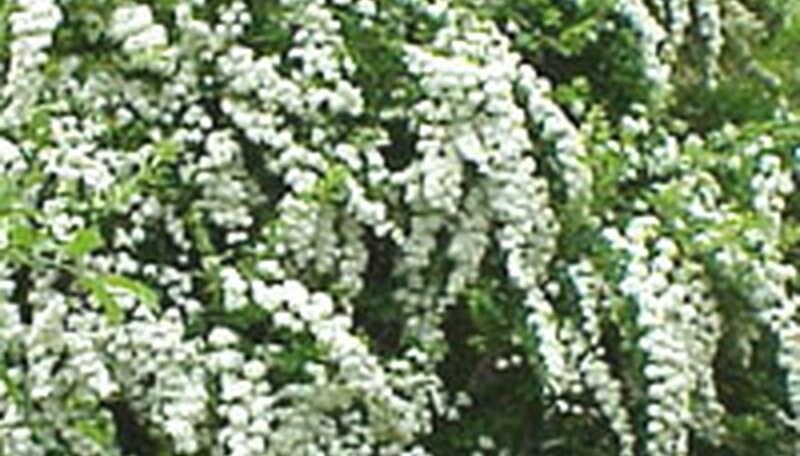 Bridal Wreath Spirea, also called the Vanhouttei Spirea, is one of the most popular shrubs for the garden. Other varieties include Anthony Waterer (carmine flowers), douglasii or Western Spirea (pink flowers), japonica (pink flowers), Snowmound (white flowers) and Swan Lake (tiny white flowers). Spring or fall is the best time to plant Spirea. Water your young plant well before transplanting it into the garden. Dig a hole the same size as your Spirea's rootball, and then fill it back up with the plain soil you dug out. Firm it gently and then keep the area moist and weeded. An application of mulch is helpful. Low maintenance Spireas require only infrequent watering, such as when you first plant them and during periods of drought. They don't need much fertilizer: just spread a little general-purpose fertilizer over the root area once each fall. Spireas are fond of organic mulch, which keeps the soil moist and cool and can protect the root system from frost. If you would like to keep your Spirea compact and tidy looking, prune once yearly, just after blooming ends. You can also thin out old thick Spirea clumps by cutting old canes from the base. If flowering declines as your plant gets older, you can cut them back by as much as 30 percent to force more productive growth from the base.Aphids can plague Spireas, so keep an eye open for these small sucking insects and apply a soap spray if they become infested. Fire blight, a bacterial disease, can also afflict Spireas. If you catch it early, when branches begin to die, prune them off and then spray with a streptomycin antibiotic wettable powder. A general garden fungicide is effective if your Spirea starts showing signs of discolored blotches on its leaves or if powdery mildew starts to form.